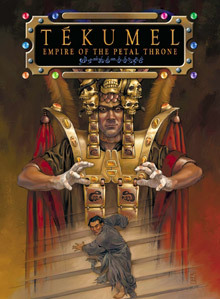 Tékumel - Empire of the Petal Throne just arrived in the mail today. This is the 2005 version published by Guardians of Order for the Tri-Stat system. One of my reasons for wanting to get more into this setting is because of all the connections between Arneson's and Professor Barker's Campaigns that I was discussing last month. In other news, I have begun doing some research on the Peshwa. I am currently working on a timeline for these Horsemen and reading up on the Riders of Hak supplement. Hope to have more for you on these guys later on. It's probably no coincidence that two of the greatest, most innovative campaigns sprung up in the same metro area around the same time. Given the amount of cross-over players (including both Arneson and Barker) between Blackmoor and the first Tekumel campaign and resulting cross-fertilization definitely a period worth looking back on and exploring for inspiration! It's an interesting setting, and like you Harvard I am interested in the interplay between Tekumel and Blackmoor. Sadly I found the GoO Tekumel to be a let down. The rules were way to complicated for my taste, and while the setting information was quite voluminous, it never really caught my imagination. I could just be me, though. I agree I enjoyed the original OD&D-like rules much, much better (though GOO can be used for things like an expanded spell and equipment list). I haven't seen the OD&D based rules, and I'm not suer that such a better fit. The GoO were fiddly, though. I have both the OD&D-like and GOO version now, but I have yet to make a comparison.